Walking With Miss Millie by Tamara Bundy, Nancy Paulsen Books (July 2017). NOW I understand why so many people are talking about this book! 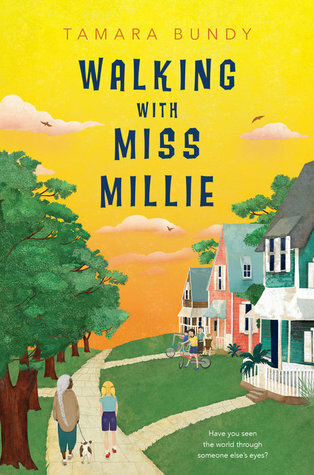 WALKING WITH MISS MILLIE is one of the latest additions to the list of middle grade fiction that tugs at your heartstrings from start to finish. Alice thinks she has temporarily moved to the small town of Rainbow, along with her mother and brother, to help her grandma whose memory is failing. The relationship she develops with Miss Millie, the elderly black neighbor next door, is a beautiful example of an intergenerational bond that provides friendship for two individuals who need what the other has to offer. In addition, Alice’s budding friendship with a neighborhood girl, her complicated feelings for her absent father, and her incorporation into the fabric of the small town result in a story that is character-centered and full of warmth. Though there are moments when you’ll need to have a Kleenex handy, this moving book is generally uplifting and recommended for readers who want to feel a strong connection to the characters in their books.